Road conditions are worsening and issues are already arising. Dec. 19, 2017 10:20 a.m. The Coquihalla is now reopen in the southbound lanes following several vehicle incidents on Tuesday. Highway 8 was also forced to close Tuesday afternoon following a vehicle incident. The road is closed in both directions 15 km west of Lower Nicola, at Aberdeen Road. There is currently no estimated time of reopening and no detour is available. Highway 1 is now open to single lane alternating traffic. The Coquihalla Highway remains closed southbound between Merritt and Hope due to several spun out commercial vehicles. DriveBC is estimating the time of reopening to be between 5 p.m. and 7 p.m.
Highway 1 is also closed near Cherry Creek between Kamloops and Cache Creek following a head-on collision between two semi trucks. An alternative route is available via Highway 8. Transportation BC is reporting between 10 and 12 centimetres of snow falling an hour. A travel advisory is in affect for the Coquihalla and travel is not recommended unless completely necessary. A heavy snowfall warning continues for the region which is causing limited visibility for drivers. ICYMI – TRAVEL ADVISORY for #Coquihalla #BCHwy5 between #HopeBC and #Merritt. Heavy snowfall continues today and tomorrow producing extremely limited visibility. Travel IS NOT recommended unless absolutely necessary, be prepared for lengthy delays, consider alternate routes. Driving conditions on mountain highways have already taken a turn for the worse. There is an assessment of the route in progress, and traffic is being re-routed from Highway 8 and Highway 1. They expect to know more by noon. 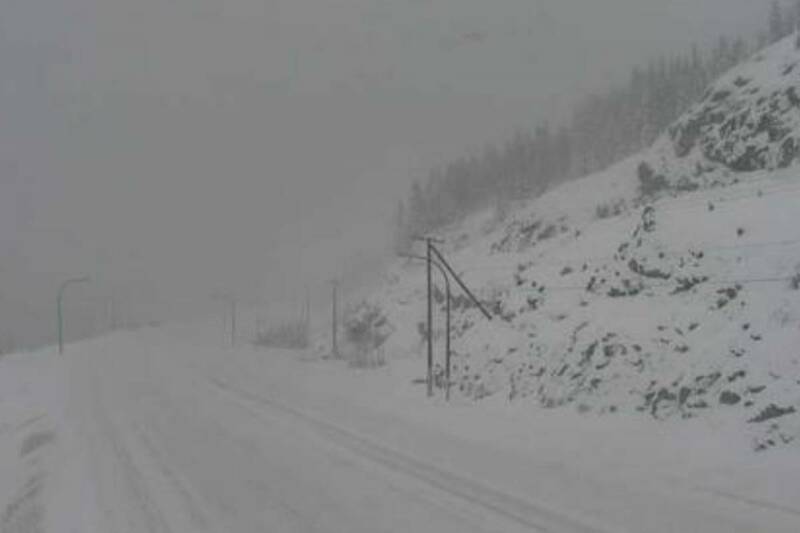 DriveBC has travel advisories in effect for a large chunk of Southern Interior highways with RCMP and meteorologists advising motorists to avoid travel today if possible. Read more on that story, here.